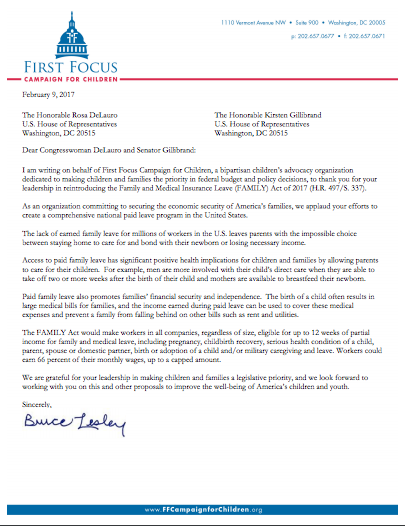 First Focus Campaign for Children President Bruce Lesley sent a letter to Representative Rosa DeLauro and Kirsten Gillibrand thanking them for reintroducing the Family and Medical Insurance Leave (FAMILY) Act of 2017. 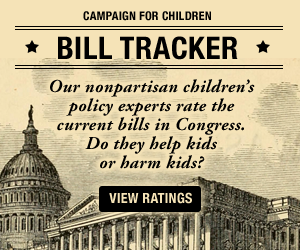 The FAMILY Act would make workers in all companies, regardless of size, eligible for up to 12 weeks of partial income for family and medical leave, including pregnancy, childbirth recovery, serious health condition of a child, parent, spouse or domestic partner, birth or adoption of a child and/or military caregiving and leave. Workers could earn 66 percent of their monthly wages, up to a capped amount.